In today’s world, people have a high degree of dependence on their Refrigerators and even a small disturbance on it may have a huge impact on their daily routine. When people search for Refrigerator service centers in Tirupur Zone, we are reliable service providers. We provide services for both domestic as well as commercial usage. We maintain a team of expert service engineers capable of handling any type of repairing service in refrigerators. Contact us immediately if you notice any refrigerator issues. Our Technicians will be at your doorstep to service your needs. We have genuine spare parts for all major brands of Refrigerator. AB Service aims at providing best repair service for all major Fridge brands. Our services are available for both domestic as well as commercial usage. We maintain a team of expert service engineers capable of handling any type of repairing service in the Refrigerator. The refrigerator is a useful home appliance for young working-class couples, bachelors and even for big families to store their left over. People will feel like having lost a hand if the fridge stops functioning. 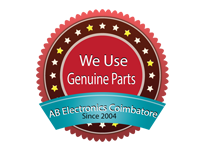 At AB services in Tirupur, we have the best solution for your in-warranty or out of warranty fridge, fridge maintenance and installation. Whether it is a breakdown or a simple maintenance call, you can get our services at an affordable price in and around Tirupur region. If you buy a new fridge online and want a demo or installation, we do it for you. Our service engineers are constantly kept trained with the latest advancements and so they are capable of rendering quality service for any type of refrigerators. We take the best care of your refrigerator. Next time when your fridge breaks down, call AB Service. When the condenser coils are damaged. In the case of Short circuits due to power fluctuations. More electricity consumption than usual.